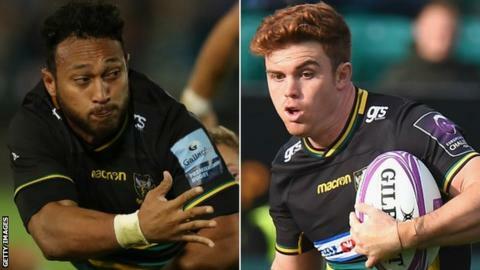 Northampton Saints centres Andrew Kellaway and Nafi Tuitavake are to leave at the end of the season. Kellaway, 23, joined Saints from Waratahs last summer and has scored four tries in 19 games for the club. Tonga international Tuitavake, 30, has been at Franklin's Gardens since 2016-17 and has made 32 appearances. "The time has come for me to move on, but for now I'm focused on finishing off the season as strongly as possible," he said. Kellaway added: "I've had a great time during my year with Saints; I really think this rugby community in Northampton is special and unlike anything else in the world. "It's been an amazing experience for me coming across the globe to play a completely different style of rugby." In January, Northampton announced the signing of New Zealand centre Matt Proctor for next season.